A felt like it would take forever, but now it’s finally done and we can show this app to the world: The Khmer Language Application. We are very proud of this: Sometimes we thought it will never happen :-) So many little things which needed to be to considered. How should the app look like? How the User Interface Navigation should be designed. Crap, all the photos will not fit – Oh yes we could maybe install a weather widget or maybe not..
Like every web app you will not find this app in the Apple store or at Google but the app is easily accessible and available for all smartphones via a link. And very important about our Friends! If you like the app it would make us very happy if you tell others about it. If you notice something that might not work, then please write to us here in the comments field. How did we have the idea to develop a Khmer language application for Cambodia?. Once a year we organize the Intercultural Innovation Camp in Siem Reap, Cambodia. The development of a Khmer Language Application for tourists was a topic in one of our camps. This app to learn Khmer language is available for Android at Google play and also a result of our Interculturual Innovation Camp in collaboration between youth from Cambodia and Germany. 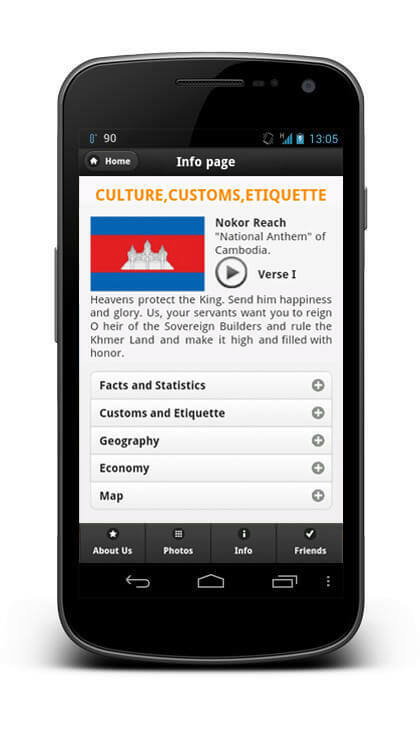 More information about this app in our article Khmer4You – the app for you to learn Khmer language! Have fun with it! The page Khmer Language Application gives you an overview of all versions, which are actually available. Very useful project although at the moment several bugs detract from the overall object of the project. I accessed the website to check it’s suitability for a student going to Cambodia next year on a school project. A couple of problems I discovered are that most of the sound files do not load and the picture files do not fit the screen, they are much to large. It is a pity as this is just the sort of website that would give visitors the basic knowledge to make their visit an better interactive experience. If you can rectify these bugs I will be more than happy to recommend the website to prospective visitors. Yes this is great app for khmer and everyone can learn about khmer language. But How about iOS version?